Our hand carved wooden spools are a major hit at shows! Using old wooden spools, many with imprinted ends or still with their paper labels, Tom carved detailed wooden Christmas ornaments that provided a home spun feel. The spools your grandma used to use... and we played with them as if they were blocks! This spool is 1.75" long and the flared ends are about 1 3/8" in diameter. A bit of the label can still be found on the bottom of the spool. Total height from top of spool to bottom rusted bell is about 4.5". Although the camera flash washed out the detail, Tom carved a detailed grooved beard and painted dot eyes. Santa's hat and pompom hang down and are visible to one side. The spool hangs from a simple ribbon with a two round beads, one barrel bead and finished off with a single rusted jingle bell at the bottom and a small wooden button on top. Signed and dated 2007. Carved into an old "Dress Maker Spool". The photo doesn't do this justice - there was too much light so the texture doesn't show in the photo. Santa's beard is slightly faceted in areas leading to the original surface of the spool. The burgundy red hat features a white pompom hanging off to one side. This spool features the original labels - "100% Polyester - 500 yards - The Anything Thread" on top and the red, black & white "Dress Maker Spool" on the bottom. A red ribbon passes through a single rusted jungle bell, two round and one barrel wooden beads with different stains before leading through the spool and a wooden button. Overall length of the ornament from bell to button is about 4.75" . The spool is signed and dated 2007 on the back side. This spool has no labels, but it's a great collectible - they don't make them like this anymore! Santa's hat droops down over his head with a carved pompom hanging off the back. Although you can't tell from the picture, he's got a cute button nose and a detailed beard carved with multiple grooves for great antiquing! Five multi-stain wooden beads, including a dark aged square lead to the rusted jingle bell. This is a very interesting piece with a very "touchy feely" quality that you'll enjoy holding and running your fingers over. Ornament C is approximately 5" from bell to button and hangs from a red ribbon. Signed and dated 2007. This is a neat old spool that offers this carving a lot of character! The stain seated into the beard's grooves making Santa look like he's been around forever. With such a vintage look and feel, it is hard to believe it was carved in 2007. The original "J & P Coats - Best Six Cord" label is still on the top end of the spool. The bottom label features a chain around the label and proclaims the thread originally sold for 15 cents! Ornament D measures approx. 4" from rusted jingle bell to button and hangs from a thin burgundy ribbon. The ornament is signed and dated 2007. With the spool itself measuring 2.25" in length, this makes for a hefty little carving! Santa's burgundy cap falls to one side and the pompom can just barely be seen to the side in the photo. His grooved beard makes for a very cute Santa you will enjoy showing off. The antiquing stain took unevenly to the spool, probably due to the age of the wood. It feels like a piece that has been around for a while and well loved. Approximately 5" from rusted bell to button, the dangling icicle features two square wooden beads, and a large dark walnut stained accent bead. Ornament E hangs from a thin red ribbon. Signed and dated 2007. We've got more Wooden Spool Christmas Ornaments on page 2! 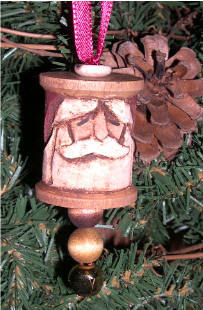 Carved Santas from Wooden Spools make great gifts for the collector - or a special treat for you! Please note that these are one of a kind carvings - you are purchasing the ornament show in the picture. Only one of each is available, do not increase quantity in the PayPal Shopping Cart! If you do increase quantity, Tom will be happy to carve you a similar, but different piece. By increasing quantity you agree to our custom order turn around for shipping. Faceless Angel Wooden Christmas Ornaments are shown on our Faceless Angels page. And don't forget our Original Reindeer Whistle - a personalized & dated ornament for the kids!